Our company was founded based on an enthusiasm for Land Rover vehicles, and helping to fill a void in upgraded factory parts as well as no longer available accessories. 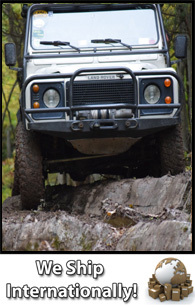 Our goal is to provide a substantial upgrade to originally under-designed Series and Defender parts, and enable your Land Rover to enjoy many more years of use and enjoyment...both on- and off-road. Raised in a family of car buffs in the 1970s certainly has a way of influencing ones' love of anything that rolls & goes at a very young age. Many formative years were spent crammed into the back of either a 1969 Plymouth Road Runner or a 1972 Volvo 1800E, as well as around many other various unique vehicles (including a 1974 Bricklin SV-1, 1978 Celica, AM General Hummer, a [cough] CJ-7, and around a plethora of custom choppers & early Harley-Davidson motorcyles). The love affair with Land Rovers started early on as well, when in my teenage years I first experienced a friend of a friend that daily-drove an old Series IIA. Realizing that these primitive vehicles could still function in the midst of the modern-day rat race was an awakening of sorts. I had to have one...and it had to be pastel green (in my opinion, the finest - and most "Roveresque" - color). As the affair with Rovers continued - and as I frequently warn anyone that is looking to purchase their first - they tend to "multiply". The Series 88 turned into a Defender 90...and even a 110, and ultimately the pinnacle with a 130. And as the stable grew, so did the variety of uses the Defenders were put through. With this usage came the realization that many parts these vehicles came from the factory with left a little to be desired in terms of durability. And Series-Defender Outfitters was born. To provide friendly and professional all-round customer service...as we are enthusiasts first and foremost. Our experience with the Land Rover vehicles translates directly to suiting the the needs of our customers. 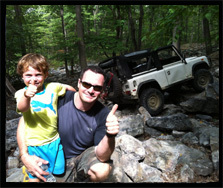 To all of you, from all of us here at Series-Defender Outfitters - we thank you for your support!